This is partly because many of the security basics have been patched away and firmed up. However, there are still ways to make sure your phone isn't compromised, along with all your passwords and sensitive data. A password manager like Lastpass is the solution. It 'hides' your passwords behind a master password, and this is the only one you actually need to remember. Android lets you install apps from their raw installer files, just as you might do on a Windows computer – this is side-loading. You can download 'apk' app files directly from your browser, or from a third-party app store like Getjar or SlideMe. If you do use your phone's digit scanner, however, it's important that your back-up PIN isn't one that's easy for others to guess – 1111, 0000 or 1234 are not suitable passwords, and if you use them there’s really not much point having any security on your phone at all. The same is true of 'pattern' unlocks: if it’s simple, it’s not good enough. Balancing complexity with ease of typing and memorability is the key here – as you end up using these logins all the time, you should find they work their way into your muscle memory pretty quickly. The best policy is to only browse sites with an 'https' URL, as this means they're secured. And never input your card details or use online banking while on public Wi-Fi – all bank websites may be secured, but that security will do nothing to prevent a so-called 'man in the middle' attack, where the hacker intercepts information being sent from your phone to a banking or other website. It sounds rather technical, but using a VPN is quite simple. Many of the most popular VPN services have Android apps, and you simply run these, choose the location of the server you want and then you’re away – your phone can 'pretend' it’s halfway across the world if you like. Frequency of security updates should be a consideration when you're buying a phone. 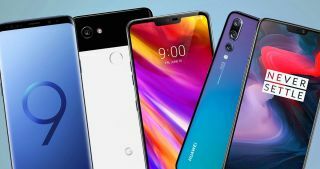 Google Pixel phones such as the Google Pixel 3 get security updates first, and Android One phones guarantee at least three years of security updates. You can sign up for Google’s free two-step verification feature at Google's dedicated website. Whenever you log in you can choose to be sent an SMS verification code, be called with the code, or use the Google app to confirm the login. A Find My Phone dashboard enables you to play an alert sound through the phone's speaker, remotely wipe the entire phone, or sign out of your accounts and lock the handset. This may not help you get your phone back, but it does let you rest easier about the threat of having your identity stolen. The best way to deal with these scams isn't a security option on your phone or a piece of software – you simply need to use common sense, and be very suspicious of any unsolicited messages you receive.